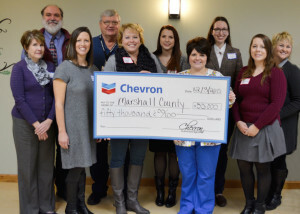 Dec. 3, 2015, Wheeling, W.Va. – Nine organizations in or serving Marshall County are recipients of grant awards totaling $50,000 from the Chevron Community Fund, a component fund of The Community Foundation for the Ohio Valley (CFOV). The Chevron Community Fund is a strategic grant-making program funded by Chevron and administered by CFOV. The announcement was made during a recognition event held on December 3 at Marshall County Family Resource Network in Moundsville. “Chevron will be operating in this region for decades, and we are committed to improving the social and economic well-being of the communities in which we operate,” said Trip Oliver, manager of public affairs for Chevron’s Appalachian/Michigan Business Unit. “The Chevron Fund of the Community Foundation for the Ohio Valley focuses on providing support for organizations that share our company’s social investment focus areas of STEM education, workforce development and basic human needs.” Representatives from the organizations receiving these grants were present as well as several county and state elected officials. Lee Ann Wainwright of Chevron stated that they are committed to supporting worthwhile projects in Marshall County. Grant applications are accepted in Spring and Fall for the Chevron Community Fund. Interested applicants can learn more at www.cfov.org/grants or by calling CFOV at 304-242-3144. Chevron is one of the world’s leading integrated energy companies, with subsidiaries that conduct business worldwide. The company is involved in virtually every facet of the energy industry. Chevron explores for, produces and transports crude oil and natural gas; refines, markets and distributes transportation fuels and lubricants; manufactures and sells petrochemical products; generates power and produces geothermal energy; provides energy efficiency solutions; and develops the energy resources of the future including biofuels. Chevron is based in San Ramon, Calif. More information about Chevron is available at www.chevron.com. Since 1972, the Community Foundation for the Ohio Valley has connected donors who care with causes that matter by making grants to organizations working to improve the quality of life in the Upper Ohio Valley. With assets of more than $34 million, the Foundation assisted in distributing more than $2 million in grants and scholarships during 2014-15. From strengthening community schools to assisting local arts programs, from building health centers to assisting victims of violence or natural disasters, the Community Foundation continues to enhance our region. To learn more, please visit the Foundation online at www.cfov.org. Front row from left: Faith Hicks/Gabriel Project, Joyce Bibey/Our Lady of Peace School, Ruth Keim/Sherrard Middle School, Tammy Riding/McNinch Primary School, Caitlin Hucik/Cockayne Farmstead. Back Row from left: Robert Strong/SMART Center, Gary Fordyce/Sherrard Middle School, Susan Harrison/CASA, Elizabeth James/Cockayne Farmstead, Stacie Dei/Marshall County Family Resource Network.